When sailing the beautiful Italian coastline of 8.000 kilometres, one can surely enjoy marvellous places and nature. A berth for a yacht is easy to find for there are numerous modern and lavishly equipped marinas all along the coast. All the marinas offer a perfect infrastructure and the impeccable services that meet the requirements of all the visitors. 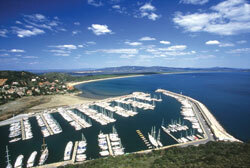 The great organization and modernization of the marinas contribute to the development of nautical tourism in Italy. Berths need to be adequate for megayachts as well with all the required services. In spite of all that, the balance between techical needs and those of nature and ambient has never been disturbed. What makes all the marinas and ports excellent is the functionality along with the safety. It is important to consult the nautical guide with charts and all the information about marinas along the coast. As you will notice, the marinas in Italy are all well equipped and offer a really good infrastructure, berths for all types of boats and yachts, various facilities and services (electricity, water, shower, bars and restaurants, shops etc.). MARINA is an artificial or natural structure used for boat anchorage and equipped with all the facilities and services. PONTOON is an internal structure of a port, floating or fixed, with berths for boats. When entering a marina prepare the boat fenders on each side to protect your boat from collision, stay far from the ferries and other boats. Remember to give the advantage to boats coming to your right side. Respect the speed allowed in the port.